NOTE: If you wish, it is also possible to combine the Wine Tour with a visit to Herculaneum instead of Pompeii. This tour option will have us leaving your accommodation and heading for Pompeii, the 2,000 year old Roman city which was all but annihilated in 79 AD when Vesuvius unexpectedly blew its top, covering the city and most of its inhabitants in 8 meters of ash and rubble. Here you are able to walk the streets of this town frozen in time where the temples, baths, villas, gardens and brothels from 2 centuries ago are still standing. Following your visit to Pompeii, we will take you to a winery where the purpose will not only be to offer you a tour, but to give you a family experience to take with you as one of the best memories of your holiday. 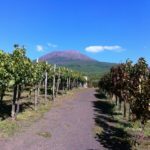 Far from the chaos and the crowds and surrounded by the fascinating landscape of Vesuvius area, you will start by learning the secrets and the history behind the old vineyards. RECOMMENDATION: Visit the archeological site of Pompeii with a PRIVATE GUIDE for a much more rewarding experience.